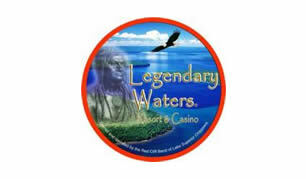 Legendary Waters Resort and Casino opened in August, 2011. They offer 41 rooms all overlooking Lake Superior and the Apostle Islands. The resort also consists of 2 campgrounds, a marina, gift shop, lounges, pool, fitness room, indoor/outdoor whirlpool, events and convention center, and 2 onsite dining options. The casino offers nearly 300 slot machines ranging from 1¢ to $5 denominations as well as special promotions, live blackjack and a players club.